Barely halfway through January and it seems I just can't get Valentine's Day off my brain. What can I say? I'm a sucker for love. Today, over on Sugar & Cloth, I'm sharing these cute little raspberry-filled heart-shaped pop-tarts. Despite how they may look, they're actually quite easy to make (the secret is store-bought pie dough). And while I'm sure you could use something like jam to fill them with, the homemade raspberry filling is too simple not to make (Plus, um, it's homemade, so yeah, you know that's going to be better than anything you get at the store.). Once they're baked, all's that's left to do is decorate them. Pro tip: if you're hosting a little Valentine's Day get-together, save the decorating as an activity for your guests to all do together. 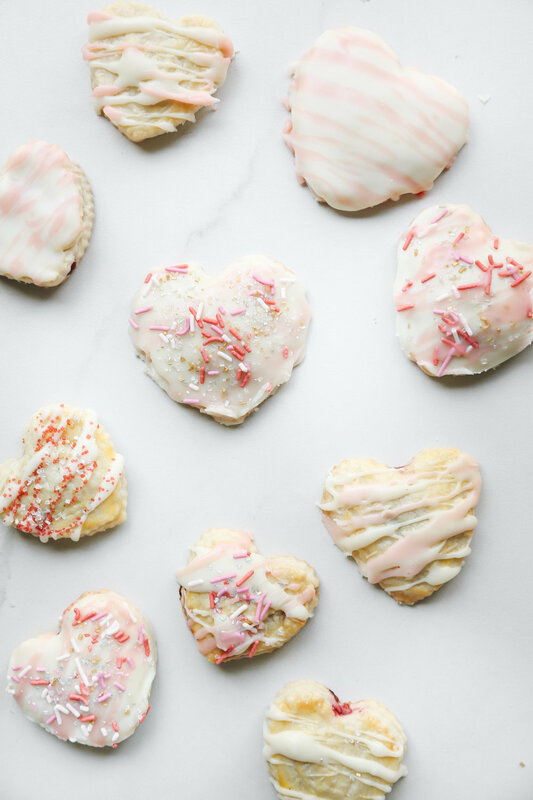 It's like decorating Valentine's cookies...but better. I know, I know. I'm totally biased. But also.... WE COULDN'T STOP EATING THEM. So, if that's any indication these are obviously way better. Seriously. Make a batch (or three) and go on and eat your heart out (but, like, in a good way! Ha! ).